Have you ever been grocery shopping at ALDI? Did you know this discount grocer is coming to California? Here are 7 things you might want to know. This post is sponsored by ALDI. I have been compensated for my time spent writing this post. All opinions are my own. 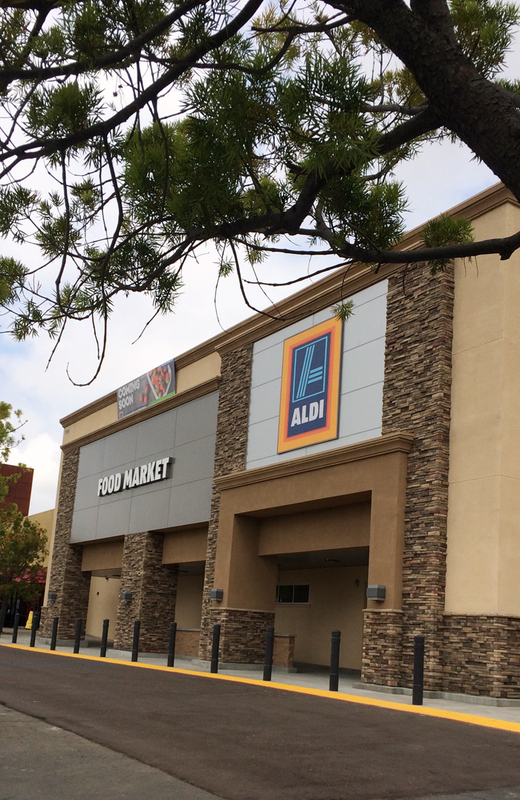 Did you know that discount grocery store ALDI is coming to California? Over the years readers have written to me, urging me to shop at ALDI because they know I am a Grocery Geek and could save even more money on groceries shopping at ALDI. The problem was: we didn’t have ALDI in California! I shopped at ALDI a few times during our last few months in Kansas and was impressed with their prices, but not overly so with the product line. Since that time, almost a decade ago, I’ve heard that ALDI has really stepped up its game in terms of organic, all-natural products. I’ve been really curious to know if the rumors were true, so you can imagine that my interest was piqued when I saw a billboard along the freeway one day: ALDI is coming to California! Say what?! Curiosity officially increased. Today I thought I would share some of my discoveries and “pull back the curtain,” as they say. 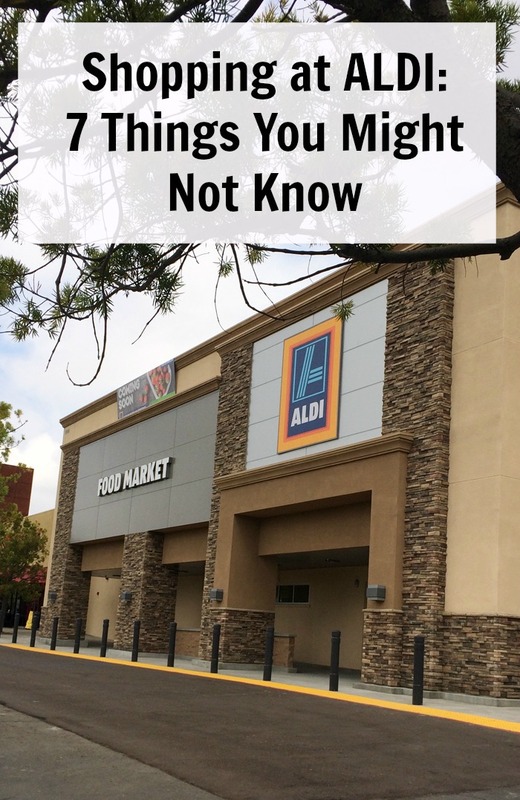 Here are a few things you might wanna know about shopping at ALDI. 1. ALDI uses a number of efficiencies to give better service and low prices. Shopping at ALDI is guaranteed to save you money on groceries. Up to 50%, depending on where and how you shop already. But, this might make some wonder? How are they able to do that?! 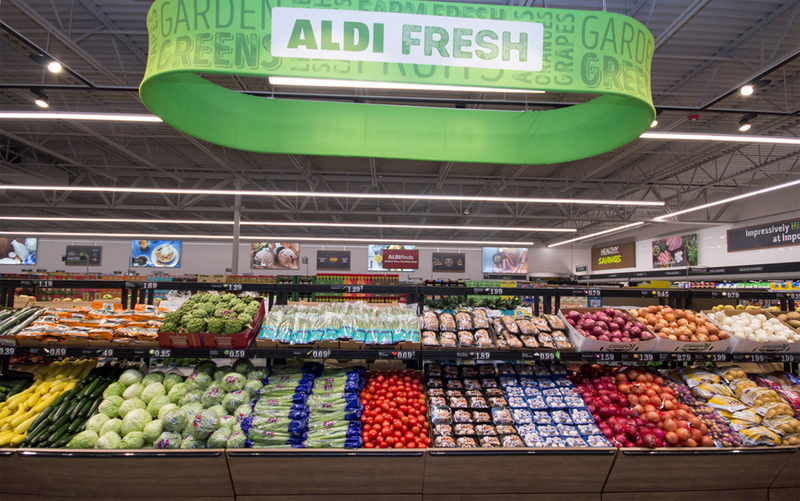 ALDI has made it a practice to study how their stores can be more efficient and to make the shopping process easy and effortless for its customers without increased costs. Efficiency helps them lower the bottom line for everyone concerned. The stores are smaller, creating a lower overhead and smaller physical footprint. The product arrives at the store packed in shelf-ready cases so the staff doesn’t have to spend time shelving product. There are multiple barcode labels on every package. This means that clerks don’t need to spend time turning a package around in order to scan the barcode. The clerks sit at the check stand, instead of standing on their feet all day. This is better for the employees and helps prevent injuries. A limited product line allows ALDI to stay on trend without having to worry about waste or moving less popular products. 2. ALDI has very high standards for the products they sell. ALDI carries 90% store brand products that they curate from a variety of national food producers. They require that their store brands be as good or better than the national equivalent. Little Salad Bar Original Guacamole. Yum! Thank goodness their prices are low because I think I will have a full cart right off the bat! We had several delicious meals that were composed of all ALDI ingredients. Amazing! Absolutely amazing. 3. ALDI does carry a few brand names so you won’t have to make a second stop on your way home. There are some name brand products (about 10% of what’s available at ALDI) that you can pick up, such as a favorite brand soda or type of toilet paper. These are there for shoppers’ convenience so they don’t need to make another stop on the way home from ALDI. ALDI strives to provide everything you need as a one-stop shop. 4. ALDI accepts a variety of payments. During its early years, ALDI accepted only cash or debit card. They have now expanded their forms of payment to include cash, Visa, MasterCard, Discover, American Express, most debit cards, the Electronic Benefits Transfer (EBT), and Link cards. At this time, they do not accept WIC or personal checks, but they have opened things up to give folks more flexibility when shopping at ALDI. 5. ALDI’s grocery cart system requires a 25 cent deposit. You will need to carry at least some cash to shop at ALDI, but not much. You’ll need a quarter in order to use a shopping cart. Now, before you freak out, know that this system has been used in Europe for over 20 years! I think it’s a great system to keep costs down. You take your cart back; you get your quarter back. The store doesn’t need to pay someone to chase down wayward carts. As a former grocery store courtesy clerk, I can attest to the fact that this job is NOT fun. By incentivizing the cart return, ALDI can keep costs down – and save some poor kid from schlepping carts through the parking lot. Ahem. 6. ALDI is not owned by Trader Joe’s. Today the companies operate independently. ALDI Nord owns Trader Joe’s, while ALDI Sud operates ALDI USA. While Trader Joe’s has its roots in the west, I’ve got a feeling that ALDI is going to give Joe a run for his money! 7. ALDI has a Double Guarantee. 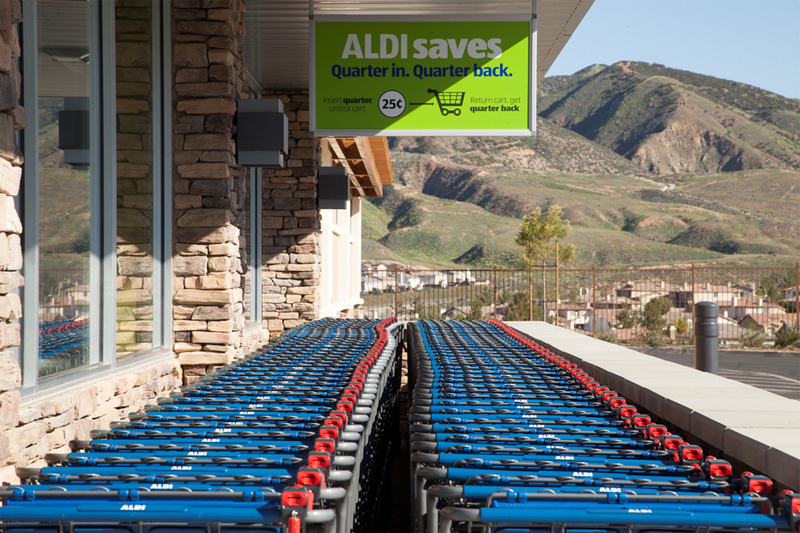 Clearly, we Californians have nothing to lose when it comes to giving ALDI a try. Can you tell I’m super excited about my new neighbors? I’d love to hear about your experiences shopping at ALDI. Keep up with ALDI on the web! For cooking tips and the 411 on what’s fresh at ALDI, be sure to add ALDI to your feed! What do YOU love about shopping at ALDI? About the quarter for the cart thing – this is just a heads up that after ALDI has been there a while, you will start seeing people offer to take your cart from you in the parking lot. After you have unloaded and are heading back, you might have someone on the way in offer you a quarter for your cart. Oh, another bonus of their cart system is that the carts are less likely to get damaged, which helps keep overhead costs down. I have heard that people share the carts. So nice! I’ve heard good things about them, but the closest one to me is still a 3-hr drive and that would eliminate any cost savings. I knew it started as a European company, and I was actually thinking Lidl was the French strain (and mom shops there frequently). I just looked it up, though, to find out they are a major competitor. Whoops! I thought that too when I went into a LIDL on our trip. I thought they were the same, but not. Good thing. Because I wasn’t happy with LIDL. haha! I am not impressed with the Aldi near me. The produce didn’t look fresh or seem any better priced. Hopefully they will continue to improve. I would encourage you to email corporate. The ALDI folks I met really want to know if something isn’t up to par. It may be an issue on the local management issue that they would want to address. I am really lucky as I have Lidl and Aldi! But I am in the UK. We just got a closer Aldi on a nearby retail park. About the quarter for the cart (trolley) what happens in Europe, and now UK is stores give away a reusable token. Aldi recently had these for sale and they were super cute so I got 1 for each of my kids. In the UK we need a £1 coin and this is used in many things like swimming lockers – so now I have mine with me always. 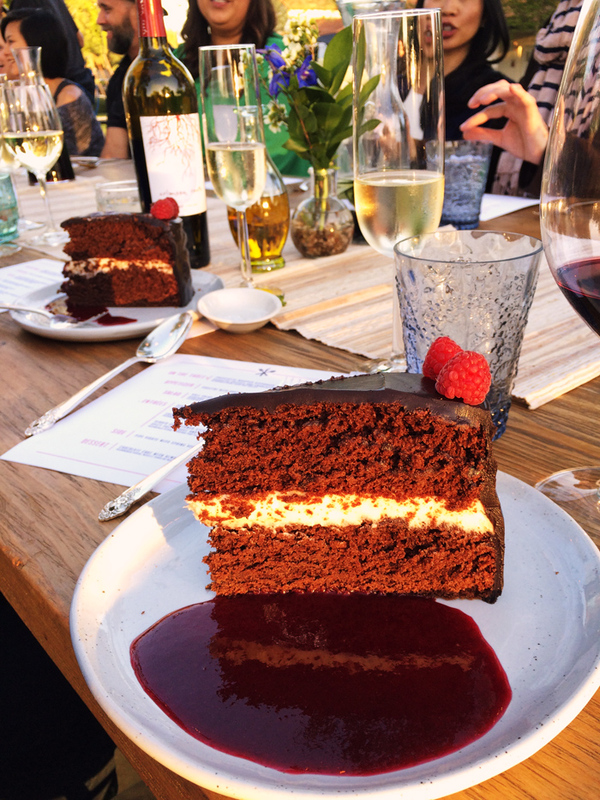 Food wise the baking section is great at Aldi – ok it’s not 100% wholefoods, but for school fayres etc it’s great. Chocolate is also great, UK chocolate has a lot of sugar. German chocolate tastes better! Here in the UK Aldi does a super 6 every week in their produce section – 6 fruit/veg at 59p each. Like does something similar. I am hoping we can get the chocolate cake recipe. It was part of a partnership with Bon Appetit magazine, so I’m hoping the recipe will come out in the magazine soon. We just got an Aldi close enough to us that I could justify going & have been a few times. The produce is still not always the greatest & depending on the day you go sale produce is no longer aviaible, I have complained every time so hopefully it will get better. The store is about 45 minutes from us but in the larger town we shop at so dont go every week. We live in a rural area & theres a Kroger 15 minutes away so thats where I do my main regular shopping :). Grocery prices here tend to be higher than in other parts of the country 🙁 Excited to here how much you save when your store opens up. I am really hopeful that we could bring down our monthly bill a little bit or at least get more for our money. I love shopping at Aldi. My kids are thrilled to get more variety in cereals. I rarely bought it from regular grocery stores because of the prices. Also, their granola bars are peanut free! Well, except the peanut butter ones. 🙂 My youngest loves that he can have an occasional granola bar. And the produce! I love saving so much on fresh produce. I have only found a few things at Aldi I haven’t enjoyed – sauerkraut, coffee & their refrigerated salsa (its very sweet). I’ve been an Aldi shopper for years! I love my local store!! It’s always clean and I don’t think I’ve ever been disappointed in their items. I do but Aldi meat and have been very pleased with it. They always have 2 special meat buys each week and their app will show what next week’s special is too ? Good to know about the app. I’ve heard that the deals do run out quickly. Good reminder. Love our Aldi’s and we have a nice one close to us. The produce isle is fantastic. Three times cheaper than our Wegmans. I do like Wegmans meat better but the chicken at Aldi’s has a much better flavor….do not know why. Huge shrimp so good and cheaper. It is not as fancy but the money I save I will gladly sacrifice a little “fancy” for huge savings. It is also crowded and the isles so small and kids screaming and older folks standing in the isles doing nothing but keeping you from not getting through. Sometimes tries my patience. Canned foods……..three times cheaper and very good. I really stock up. Many times I just hand over my cart to someone who looks like they could use it. Milk products, butter and eggs……good and so, so much cheaper. All in all we do love Aldi’s! I love our Aldi..I have found it better to go close to opening to get fresh, best looking produce. I’ve shopped at Aldi since 1994. They definitely make it easier to stretch the budget! Just like any place, you have to shop smart. Some of their products can be found cheaper at other stores. However, you have to decide if your time and gas are worth the trip to the other store. My husband works at the other store so it’s worth it to me since he’s already there! I’m going to Aldi tonight. Their produce prices are very good. Sometimes the produce is good, sometimes it’s not, you just have to keep an eye on it but that’s really the case anywhere if you think about it. I love all the new items they’ve brought in over the years. It’s much easier to shop healthier there now. They have some great cheese prices and selections too! One other thing I’d like to add for knowledge sake is you need to take your own bag or box. Sometimes they have boxes there you can find or you can purchase their bags for 10 cents. Here in CA we’re pretty used to having to provide our own bags. It’s the law in many cities, but thanks for the reminder! No Aldi in CO :(, but I remember going to Aldi with my Great-Grandma in Missouri when I was a kid. At the time, there were no scanners in the stores, so the checkers had to have memorized all of the prices (maybe they were barcodes…I’m not entirely sure). They sat at their stations typing in numbers continuously. It was truly mesmerizing to watch them work, retrieving all of those numbers at will. Do you still have to bag your own groceries at Aldi? Yes you do. It’s another way that helps keep costs down. Isn’t it funny, I end up bagging my groceries at most stores I go to because I don’t want to wait. Maybe I’m weird? Love their spices. 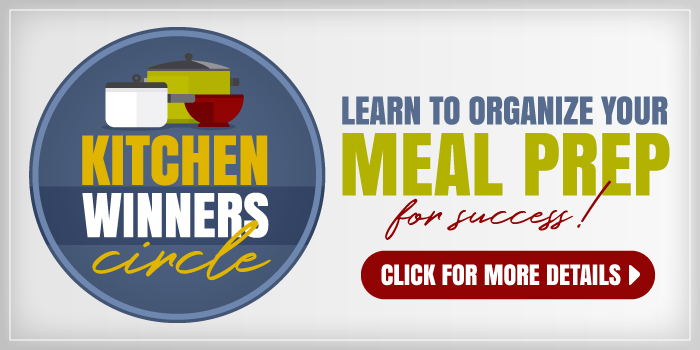 Not everything you might want for off-the-wall recipes, but most of what you need for everyday cooking, and so much cheaper. I have to drive an hour to one, but my daughter lives in the same town, so it works out. Really wish they would put one into my local shopping town. They now accept credit cards?!!?!? This is news to me, that was the only thing that has held me back from shopping there frequently (because I like to get points on my cc). On the positive side, I do save money on dairy and some produce at Aldi. However, the employees at my location are, as a whole, very rude and brusque. Some produce (avocados, potatoes, asparagus, mushrooms, zucchini) are generally a good deal and fresh enough. But their fruits and more perishable vegetables are seriously lacking. I don’t like shopping there as an experience, so I try to limit it as much as possible, while still saving some grocery money. While I like the cart and bagless system they have set up, I cannot stand how they literally shove your cart of food away after paying, before you can even return your change to your wallet. I love efficiency but they take it to an extreme which results in poor customer service. I would hope I just have a bad store and most are not like that. I’ve only shopped in one Aldi on the East coast. I live on the East coast and find the employees at our Aldi’s to be very pleasant and helpful, usually more so then in the bigger grocery stores. I do about 80-85% of my shopping there. I love their prices on organic milk. I buy most of my produce there but just like any store sometimes it looks better then others. I have not bought any of their meats. We still tend to splurge at the local butcher in that department. I am sorry to hear that your service experience hasn’t been positive. So far they are really nice at our store. Our local Aldi’s has very friendly employees. One fellow even says to my son, “How are ya, brother?” The cashiers have always been polite and helpful. I don’t do all my shopping there but I do buy some items when I take my adult son there to do his shopping. Their prices on red grapefruit and avocados can’t be beat. I also like their frozen fish. I second all the comments about Aldi produce. I no longer buy produce there because of its short shelf life. It’s a problem in all of our local stores, not just one. You also need to be careful of their pricing, especially on meats, I will often find that my local Woodman’s has better prices. Just wanted to add my opinion about the produce at Aldi’s. First, I have been to quite a few Aldi stores in Florida and have never seen the produce section as pictured in this post; normally the selection is very limited to basic fruits and vegetables which are very competitively priced. Second, Aldi does not handle the produce the same way most grocery stores do, meaning it is not refrigerated when the store is closed, which contributes to the short shelf life once you take the produce home. Lastly, you must try out their store products for yourself to determine if they will work for your family. Some things are wonderful, others, not so much. At our store, there is one aisle (both sides) of non-refrigerated and then one section of refrigerated, but my other grocery stores are the same way. Is there any list of where they’ll be bringing Aldi’s? This news story lists them. They aren’t all on that list Leslie linked to. I believe they are adding more over the course of the year. I love the Aldi store near my house. I try to stop at least once a week. Someone mentioned the chocolate-it is fabulous-love German chocolates. I agree on the produce-it can be a hit or miss anytime of the day. I went later on a Sunday and the grapes were perfect-went back the next day and no so good. Sometimes I get into trouble when I go-especially around Christmas time. They have seasonal or specialty items you don’t see all year. Also their frozen pasta(tortellini and ravioli) are delicious-just bought a bag pear and gorgonzola cheese-cannot wait to try them. I also love the cart system-I always keep a quarter in my cup holder and when I am done shopping put the quarter back so I always have one. The special buys and plant bulbs are wonderful too. My spring bulbs I planted last fall are popping up right now and I bought the cutest pair of ladies rain boots for $15.00. You cannot beat the prices but there are some items I did not care for just like the national grocery stores. We love the chocolate butter cookies from Germany. My Aldi is across the street from Costco – lucky me! I do 95% of my shopping at those two stores. If I go early I am home from both with a full car in less than 2 hours! Rats! I finally was able to find a list of the new stores and there’s only 1 in Northern California and it would be an all day trip just to get there. It’s WAY up in Northern California. I hope there’s plans to build more and some are in the SF bay area. I began shopping at Aldi two years ago and I definitely save money. I love their organic fair trade Keurig type pods, great price on milk and eggs. 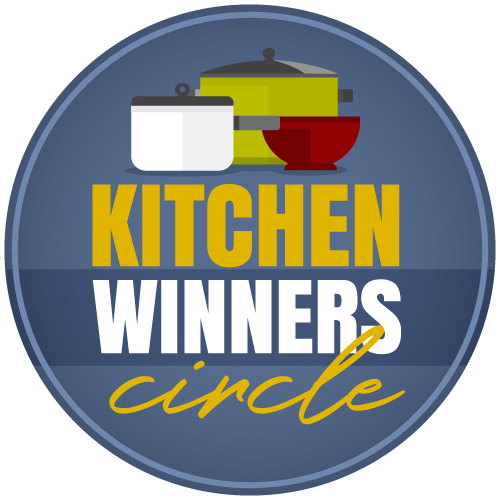 Right now I have boneless chicken thighs and mango peach salsa from Aldi in the crockpot- it’s a favorite. I’ve had good luck with most of their meat, and they’ve recently removed artificial colors and additives from most products-Ask the manager when they get deliveries and re-stock their fruit and veggies. I have great luck when I get there early on a Saturday- by 1 pm the produce is too picked over. I’m lucky Aldi is on my way home, and across the street from a Stop and Shop. I often go to Aldi mid week to buy more of their produce specials and their meat special that starts on Wednesdays. On weekends I go to Aldi first, then go to S&S for whatever I couldn’t find at Aldi. The only things we haven’t liked are their brand of sport drinks, and most salad dressings. The dressings that are organic or their premium store brand (still inexpensive) are better. I shop there frequently- we’ve had one for 2-3 years and more have moved into the Houston area since. The produce is either wonderful or horrible. I recently found a bag of cutie oranges for $2. Almost passed them up, as each bag had one moldy orange. Decided that throwing away one orange would still put me ahead of paying $7 for the same bag at another local chain. I’m glad I bought them, the rest were delicious. Finding good bananas there is like finding a unicorn, but I have been very pleased with everything else. Chocolates and cheeses are excellent. I love Aldi! I can drive there, get my groceries, pay, bag them and be home in 30 minutes. I buy chips, pretzels, granola bars, baking supplies, eggs, produce, bread, milk and cheese there. We also like their frozen chicken tenders and we recently tried their frozen seasoned fries – one of the few convenience foods we buy. The prices can’t be beat. The employees are always friendly and the store is clean. A pineapple for $1.29 can’t be beat! Jessica, after reading this, I am going to give Aldi another shot. I wasn’t very impressed the first time I went although I did like their above average selection of European products. I do have a friend who buy everything from Aldi except string cheese since her kids will only eat one kind of those. She loves Aldi! I have been several times now and have learned new things each time. Could be worth your while to go again. I shop at Aldi first and then my local Giant which is right next door. I do well on the fresh produce and if it doesn’t look good, I pass on it and get what I need at Giant. Aldi just had ten pounds of potatoes for $1.69! I picked up twenty pounds at that price. I also like that meats go on sale from Wednesday to Sunday. My husband and I shop on Sunday afternoons, which is our”date ” for the week. It’s great that we spend time alone and he is able to see food prices and how much we can save by going to discount stores. I have only bought their boneless skinless chicken breast. If I wait until Sunday, they are marked down even more. Sale price for us is $1.59 per pound. Each package has four or five breasts in it, but Sundays they put an additional $2.00 each package. The packages go down to less than five dollars each. I feed my family of five a whole meal on one of those, so I stock up. I also mix up my marinades for them before putting them thru the floodwater. That’s good to know about the sales. I haven’t seen anything marked down at my store, but will keep my eyes open. We stopped going to Aldi about 3 years ago when we found out about all of our food allergies. 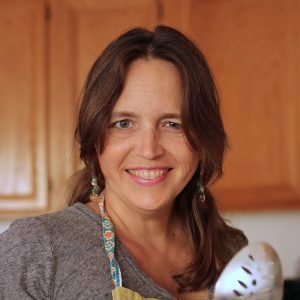 It was simply too overwhelming to me to learn the ins and outs of several food allergies and basically all labels (at the time) said may contain milk (my husband’s biggest allergy). We recently gave it another try because my brother was talking about how much it had changed and told me they had cashew milk. I have been super impressed because it’s changed completely! They have tons of options now that we eat healthier. My kids also get super excited because I now buy them fruit chews and boxed juice because they have all natural and dye free options! Our whole family has issues with food dye so this makes me so happy! I have been going for the past month and have been really loving the savings too! Yay! What a fun discovery! I’m bummed that they won’t be opening a store near me. We lost several local grocery stores thanks to the big Haggen debacle. They’re putting different stores back in their spots (Smart & Final, Vons, etc.) but I would have loved a different option. I shop mostly at Trader Joe’s, but I would love to try a store like Aldi. My biggest tip for shopping at Aldi- go as early in the day as possible. The few times when we’ve gone in the evening a lot of stuff was out of stock so we try not to go after 4 in the afternoon if possible. I love shopping at Aldi. Their almond milk is great and cheap. I wanted to say that their weekly non-food special buys can be great as well.I’ve bought a cool mist humidifier, fake down comforter, and garden tools, among other things. Good quality for the price. I like that next weeks ad is available in the store. Sometimes that is easier than looking online. Sometimes you do have to get there early to get the special buys. There is a connection, but they are not owned by the same company and never have been. The two brothers split their mother’s business. One went on to buy TJs and the other to develop ALDI in the US. Oops! I see you already know that. In my state, Aldi’s far outnumbers Trader Joe’s (only two in the state — 5 miles apart). There’s been an Aldi’s in my small hometown for at least 35 years. I’ve never been an Aldi’s shopper. Every few years I give them a try and I’m always disappointed. The last time I went I was shopping just for basics. They didn’t have half of what I wanted and the rest I found cheaper at Wal Mart (my next least favorite store) and Trader Joe’s. We finally got an Aldi in December. I love all the organic and natural products that they have there. Their prices are so much cheaper than any of our other stores on those products. Our store has a limited amount of organic produce but the quality has been good on what I have brought. Their products are clearly marked for allergens but you have to read the labels diligently because there are a good amount of products that are produced in facilities that process peanuts and tree nuts. I live in Kansas, near Wichita. I have been a loyal Aldi shopper for several years, and they just keep getting better and better! We got a new Aldi in Derby, KS in December, and it is wonderful. Blows the Wichita stores clear out of the water. It is clean, the produce is high quality with some organic options, the grass fed ground beef is excellent amd fairly priced. I will say that this new store is much, much cleaner and better maintained than 2 of the 3 Aldi stores I frequented prior to the arrival of this one. Still, if I had to choose only one grocery store, Aldi would be it! As it is, the majority if our grocery money is spent there, and we fill in at Costco, Natural Grocers, Dillons. We are getting an Aldi in our town finally but I’m not impressed. I’ve been to three different Aldi in the area here and I thought the produce was terrible (I had MANY things mold or turn to mush in less than 48 hours after bringing them home – most produce, including fresh picked from our yard, lasts at least a week for us). I do like their crackers and if I need cheep coffee, they are fine too. Dairy and meat prices here are not even close to the sale prices at the traditional groceries (anywhere from $1 to $6 – really – higher per pound). I only shop there very occasionally. I also haven’t found their baking supplies up to snuff. I guess I’m just picky or something. From what I hear, locations can vary somewhat. I encourage you to make use of the double guarantee if you buy something you didn’t like. I took back a package of lettuce that went bad too quickly. Wow! Thanks for replying Jessica – I really wasn’t expecting that. Unfortunately, my experience has been basically the same no matter what Aldi I have gone to (three in different parts of our large metro and 1 in another sate). I truly want to like it but I’d have to return better than 50% of the groceries I have bought each time I’ve been there. At that point I don’t even want the replacement product. I’m really glad that others have a better experience – I know that Aldi can be a lifesaver for many when it comes to the grocery budget. I just went to the grand opening of Aldi in my neighborhood here in Orange County, and I am sorry to say I was disappointed! Prices were good, but I’m lucky that I can find those prices other places, so I feel like they need to stand out a little more for me to shop there. Employees were very nice and friendly and helpful, but the two deal breakers are 1) bagging my own groceries and 2)returning carts to the front of the store. I have 5 small children, and keeping them in check while unloading the groceries onto the conveyor belt before I pay, unloading them onto the bagging table, using both my hands to bag all the groceries (I need more hands!) and then unloading groceries into my car is a lot of hassle. And I don’t mind returning carts (I always do), but I parked quite far from the entrance and bringing the cart back to the front instead of to a “return carts here” stall in the parking lot with kids alone in the car added more stress to a grocery trip. I am sure I will go back, but I was hoping it would replace my other stores. Until my kids are older, I’m afraid it won’t! Thanks for sharing your experience, Katie. I can totally understand the shopping with kids angle. The day WILL come when you shop alone, but I get you! We moved from VA last summer and I find myself missing Aldi so much up here in Maine! I loved their chocolate chips, cereal and frozen fruit. Their produce was always top notch and prices on their organic produce was always great! I will have to check out the chocolate chips! I’ve been shopping at Aldi for many years. Stores vary. The one closest to me is lousy but there are 2 under 10 miles away that rock. Also, check the clearance rack often. I consistently score organics for next to nothing. I love my local Aldi (Atlanta, GA suburb) but I will say that the best time to go is in the morning when the store first opens for the best selection of produce. I often take advantage of the Wednesday meat specials on chicken breasts but sometimes they are not available when the store first opens, if the truck is delayed. I don’t use their flour–I prefer King Arthur for baking, but I stock up on their cocoa powder at Christmas as it’s a seasonal item and I use it year round to make your homemade chocolate syrup recipe! :- ) My kids love their cereal, pretzels, veggie straws, granola bars and cookies. I have never had a problem returning anything that I have bought that I am not satisfied with. Thanks for your post! I have to agree about their flour; I bought a bag once and when I made waffles — my usual recipe — they came out weird! !